Although most of these images had been taken with black and white film (the others are either scans of colour negatives or a digital camera was used), I did not develop the film so I am not placing the photos in the 'Black and White' gallery. 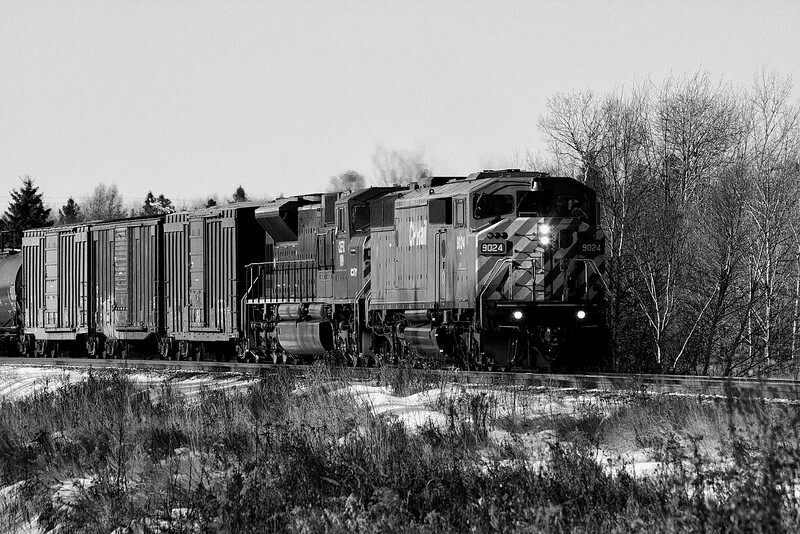 CP 9024 with CEFX 109 heading east at Barclay Ontario. I took this photo with a Canon 40D just before I took the photo next to this one (in this gallery). I ran the photo through Photoshop CS4 and used the Silver Efex Pro plugin to get the effect you see here. The next photo in the gallery was taken just seconds after this photo but I used a film camera loaded with black and white film.